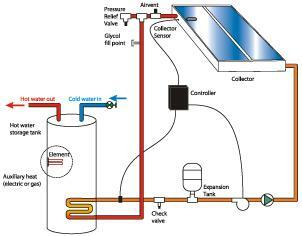 In a direct solar water heating system, the fluid which transfers the heat from the solar collector panel to the hot water tank is the water itself. For closed loop systems – pictured above – in which heat is transferred to the hot water tank via a coil (heat exchanger), a heat transfer fluid has to be chosen which is pumped around the system from the solar collector to the coil in the tank and back up to the collector again. Different fluids have different specific heat capacities – the measure of the heat energy required to raise the temperature of a given unit amount of fluid by a given temperature. Specific heat capacities in the UK are typically given in British Thermal Units (BTU) per pound degrees Farenheit (BTU / (lb.F)). One BTU will raise the temperature of 1 pound of water by 1 degree Farenheit at 68 degrees Farenheit. The international unit for specific heat capacity is joules per gram Kelvin J/(g.K). The specific heat capacity of plain water at 20 degrees Celcius is 4.2 J/(g.K) which is high relative to most other common liquids – for example antifreeze which is commonly used as a heat transfer fluid in solar water heating systems in colder climates has a specific heat capacity of 4.0 J/(g.K). Olive oil for example has a specific heat capacity of just 1.97 J/(g.K), which is higher than in most oils which all have a low specific heat capacity. When choosing a heat transfer fluid, a high value of specific heat capacity is essential since the higher the value, the more energy the fluid will carry with a raise in temperature, and the more efficient the installed system will be. In addition to the specific heat capacity, there are other features of fluids which make them suitable or unsuitable as transfer fluids. A low coefficient of expansion is important since you do not want the volume of the fluid to increase much when it is heated. Low viscosity is better than high viscosity since a low viscosity fluids are easier to pump around the system. The freezing point is important in cold climates since if the fluid freezes in the winter it can cause serious damage to the system. The boiling point should ideally be high since if the fluid boils it generates high pressure steam. The flash point should ideally be very high so that the fluid does not become flammable at operating temperatures. Ideally the fluid should not corrode the pipework and other components in the system, and the fluid needs to be stable so that it does not need to be drained and replaced regularly. If there is any chance of the fluid coming into direct contact with potable water, it must have very low toxicity. Where possible – warm climates – water is often the chosen fluid to use as it is cheap, and easy to use and source. It does however have a high freezing point, a low boiling point, and its acidity can make it corrosive. Also, over time the minerals in the water can build up in deposits inside the system leading to blockages and inefficient pumping. 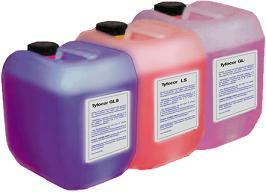 Where water is not suitable, non-toxic types of antifreeze are used. Standard ethylene glycol is very toxic and therefore completely unsuitable, but a food grade polypropylene glycol (usually mixed 60/40 with water) has a low freezing point of around -20 to -25 degrees Celcius. An additive is usually added to inhibit corrosion. Polypropylene glycol is found in many products including mouthwash, deodorants, and also as an emulsifier in some drinks. 5 litres of this solar antifreeze can be purchased for around £30-40 which should be sufficient (when diluted correctly) for most single or double panel closed loop solar water heating systems.